Three years ago my team visited Khulna, a district in the southern coastal region of Bangladesh. We went to meet the communities trying to rebuild their lives there after their villages were almost completely destroyed by Cyclone Aila in 2009. To assist the rebuilding, the Bangladesh government lent its support, channelled through a trust fund that was established from its own budgetary allocations. These funds were intended to protect the Bangladeshi people from such disasters, which are sadly becoming an ever more frequent occurrence in my country. The Bangladesh Climate Change Trust Fund (BCCTF) distributed a grant to construct cyclone-proof housing for the afflicted community, at a cost of US$1,400 each for each house built. At the time of our visit to Khulna district, more than a year after the project should have been completed, we found a few half-finished constructions – four pillars, no walls, unfit for human habitation. It was as if policy-makers could not see how vulnerable the people in this disaster-prone region were, and what a mockery the half-built homes made of their plight. My colleague spoke with Khadija Begum, a local resident who should have benefited from the construction project. She had tethered some material over the four pillars of her new “home”, that blew in the wind as she told us that there had been no-one overseeing the construction work and that the builders had disappeared, delivering less than half the materials and selling off the rest. We made a documentary on the case and brought it to the attention of the media and the government, seeking to give some redress to Khadija Begum and her community – people who had already suffered immeasurably at the loss of their homes and their livelihoods, and were then struck by the second scourge of corruption. Following Transparency International Bangladesh’s report, the BCCTF allocated further funds to complete the construction of cyclone-proof houses with walls. However, there is still debate among experts as to whether these structures would really protect people from any cyclone, especially if the storm surge goes beyond the floor level. Moreover, no washroom facility was provided within the structures. But the story isn’t quite so simple. The BCCTF is a pioneering initiative of the Bangladesh government to increase support to local people through small grants that can help them to build up their resilience and adapt to the impacts of a changing climate. The BCCTF commits Bangladesh’s own national resources directly to the cause of climate change preparedness. These funds are a scarce and vital lifeline to the poorest and most vulnerable people in Bangladesh, the country considered to be the most vulnerable in the world to the impacts of climate change. It is precisely because of the vital importance of this money, that we at Transparency International Bangladesh have been campaigning to ensure that it is safe from the kind of anomalies that left Khadija Begum without walls. Introduce a complaints service so that individuals affected by corruption in remote areas would be able to seek redress. Since then we have been working with government and civil society to build up these safeguards to better protect the vital and scarce resources that we as a country have, so that we are protected from ever increasing extreme weather events and rapid sea level rise. For this reason we were beyond dismayed to hear Finance Minister A.M.A. 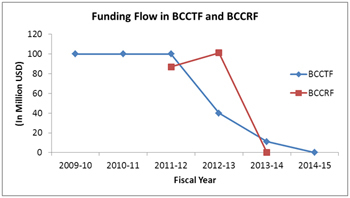 Muhith announce in June that funding to the BCCTF would be reduced, with no new allocation in this year’s budget and indicators that the fund might be left empty for a longer term. Slashing the budget of our country’s adaptation fund because of corruption is like cutting off your head when you’ve got a headache – and in a country like Bangladesh, it’s tantamount to suicide. This step will ultimately make the climate victims even more vulnerable. 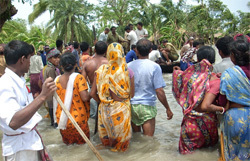 There is a real risk that the withdrawal of national funding from the BCCTF could prompt foreign donors to question the sense of supporting Bangladesh in its adaptation efforts, and in turn withdraw from Bangladesh’s other main source of adaptation financing – a multi-donor trust fund called the Bangladesh Climate Change Resilience Fund (BCCRF). It is important to note that there has been no allocation into the BCCRF since January 2013, either. The Bangladesh government is a vocal actor in international negotiations, calling for developed countries to pay their dues to developing countries for the impacts of climate change. They are also calling for developing countries to be granted more ownership and control over their own adaptation and mitigation efforts – to thwart some of the bad patterns of foreign-led development initiatives that fail to be effective due to lack of ownership and understanding of local realities. My government is correct to campaign for our right to compensation and our right to define our own future, standing as we are on the frontline of climate impacts. But in order for these arguments to be taken seriously on the global stage, the government of Bangladesh needs to take corruption seriously at the national level – and invest in enhanced safeguards, transparency and oversight of climate money. They should not cut and run, abandoning their people to a sinking ship.